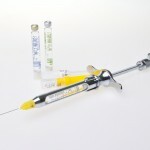 Lidocaine one of the most commonly used local anaesthetics tends to have a low pH range. It has been suggested that buffering (alkalinisation) may reduce pain and some but not all studies has supported this. Patients over the age of 18 with mandibular molars with symptomatic irreversible pulpitis were eligible for inclusion. Each patient rated his or her initial pain on a Heft-Parker visual analog scale (HP-VAS) and were randomised to receive 2 cartridges of either 2% lidocaine with 1:80,000 epinephrine buffered with 0.18 mL 8.4% sodium bicarbonate or 2% lidocaine with 1:80,000 epinephrine with 0.18 mL sterile distilled water using conventional IAN block injections. Endodontic access preparation was initiated 15 minutes after injection. Lip numbness was required for all the patients. Patients rated pain during access cavity preparation or initial file placement. The success rates were 62.5% and 47.5% for buffered and nonbuffered groups, respectively, with no significant differences between the two groups (P = .381). buffering the 2% lidocaine containing 1:80,000 epinephrine with 8.4% sodium bicarbonate did not improve the success of the IAN block in mandibular molars in patients with symptomatic irreversible pulpitis. increasing the pH of lidocaine decreased pain on injection and augmented patient comfort and satisfaction. Masoud Saatchi, Abbasali Khademi, Badri Baghaei,and Hamid Noormohammadi. Effect of Sodium Bicarbonate–buffered Lidocaine on the Success of Inferior Alveolar Nerve Block for Teeth with Symptomatic Irreversible Pulpitis: A Prospective, Randomized Double-blind Study. JOE article in press. Cepeda MS, Tzortzopoulou A, Thackrey M, Hudcova J, Arora Gandhi P, Schumann R. Adjusting the pH of lidocaine for reducing pain on injection. Cochrane Database of Systematic Reviews 2010, Issue 12. Art. No. Buffering with sodium bicarbonate did not improve the success of the IAN block in mandibular molars.